I use a community dryer to dry our clothes each week at our retirement complex. Recently this fella came out with our dried clothes, deader than a doornail. But he was at least praying for dear life as he left this world! OMG! This is priceless and what an amazing capture! Perfect for Halloween too! Ginnie Hart: I thought it'd be perfect for this Halloween week, Robin. Thanks! That would be a tasty snack, Ginnie. Ginnie Hart: I'll save it for you, Ray! holy crap he's dancing !!!!!! Ginnie Hart: Or really praying hard, Dennis. He died for art. Now he has been immortalized on your site. Ginnie Hart: Sad but true, Michael. That is such a random way to meet your end. An omen? Ginnie Hart: Maybe an omen for Halloween week, Michael...as in just in time? Absolute fabulous shot, love the colours and the outcome. You had fun with this little fell. Ginnie Hart: He obviously was in the dryer before I put our clothes in. What a surprise when he popped out. YES, deader than a doornail. He may have knocked on the window, but I was back at the apartment with the timer on. Poor thing. Hopefully he didn't feel a thing. At least it wasn't a cockroach Ginnie. Ginnie Hart: You do have a point, Richard! Ginnie Hart: Thank you, Chris. The whole thing still amazes me. Hello there!. He looks like he is applauding your attempt to give him a fine portrait! Ginnie Hart: Good to see you back, SAVO! I think he must have been waiting for YOU! Perhaps he was the overseer in the laundry Ginnie. Why don't you have him stuffed? Ginnie Hart: HAHAHA! Maybe for posterity, I will, Chad. Ginnie Hart: Just in time for Halloween, Sally? Thanks. The lighting and isolation work to great effect here Ginnie. I bet seeing him in your washing made you jump! You got a good picture out of him though! Wow - what an expereince and what a photo! Great! Fine that you tried to save him. Ginnie Hart: I even put him in water to see if he would revive, Philine. Bedankt. Ginnie Hart: I know, Lisl. It did give me pause! Poor thing. Oh, shame! poor thing! I love the way it has its "hands" locked together. It probably thought with the heat, it had ended up with the Devil. Ginnie Hart: And to think all he wanted was to warm himself up a bit from the last load, having no clue this crazy woman was coming in with a new load! As a beautiful jewel ! Ginnie Hart: That's how I'll remember him, Marie. Other-wordly!! He/she/it looks larger than life here. Very cool!!! Ginnie Hart: Thanks, Marcie. He sure did surprise me when I found him! Ha ha! RIP Jiminy Cricket! Ginnie Hart: HAHA! I hadn't gotten that far, LC, to be honest. Great picture, Ginny. It's very impressive and together with your background info it made me give a shudder. You can't look into those eyes for long! Ginnie Hart: He was actually pretty tame and so helpless, Petra. I actually felt sorry for him. Ginnie Hart: Poor thing, indeed, Janet. I'm glad I could at least immortalize him! I'm so glad he didn't disintegrate in the dryer, Ginnie, or we would never have seen him immortalized so cleverly with this superb, artistic image. Ginnie Hart: Thank you, Beverly. To be honest, it all still shocks me. Getting ready for halloween ? Send for the cricket busters. Ginnie Hart: HA! Exactly, John! Thanks. I like the lighting, emerging from the dark - super shot Ginnie! He looks a little scary or maybe that should read a little scared! Ginnie Hart: Poor thing, Cherry. He was on his last leg. Quite a stunning shot, Ginnie! Ginnie Hart: Thanks, Tom. Poor thing, though! Ginnie Hart: Kinda sad, though, Victoria, right? Awesome photo Ginnie with the black background... Sad but cosy end to his life. Ginnie Hart: Thanks, Jacquelyn. At least he was warm! A fine close-up Ginnie, I'm glad you found this before you put your clothes back on. I thought Sheila's V.& V.was so very personal and touching, especially for those of us who have read of hers, and Maurice's travails over more recent times. Ginnie Hart: Thanks, Brian. And thanks for reading Sheila's post at V&V. She'd love to know you read it if you didn't leave a comment, I'm sure. Hmmm....are you sure it was an insect? Ginnie Hart: HA! Yes, Juan Carlos. It was not only an insect but Jiminy Cricket! Ginnie Hart: HA! Indeed, Dave. Looks as if he is praying Ginnie! Great capture. Ginnie Hart: That's what I thought, too, Richard! Merci. Ginnie Hart: That or praying for dear life, Rian. Poor thing. Ginnie Hart: Thanks, Peter. It was a bit late for prayers but I did give an appropriate moan and groan for him. Poor thing. Poor dude! I once washed a lizard- so sad! 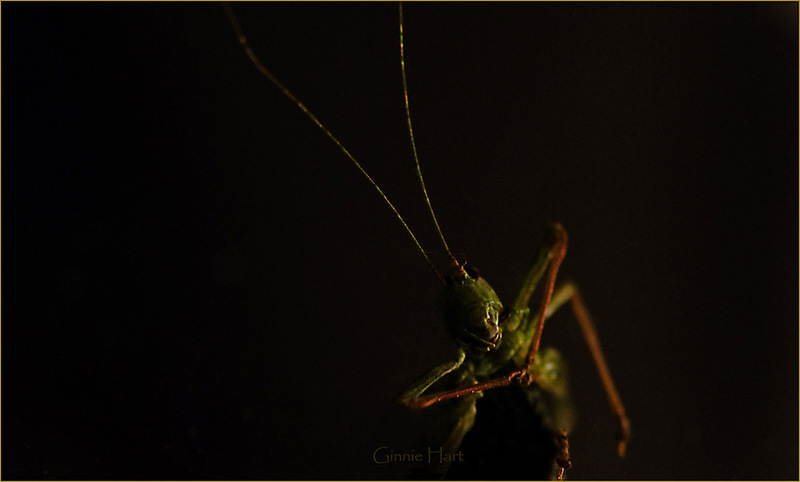 i kinda like the way you photographed this though- it doesn't look like a shot of a dead bug - it's a portrait of a grasshopper. Very different! Ginnie Hart: As I said, Elizabeth, truth is stranger than fiction!!! Indeed. oh gosh, poor little guy, should have died a normal quick death in a bug zapper or under a shoe... it's kind of a scary picture! Ginnie Hart: I know, Elaine. Hopefully it never "hit" him what was happening! Ginnie Hart: Yes, indeed, Luiza, even though his last smile. At least he was warm when he died!! Nice shot, I like the lighting! Ginnie Hart: Yes, Helen. What a way to go. Thanks. This is amazing Ginnie! Was it still in one piece? Yuo did a great job making this spooky photo. Ginnie Hart: Bedankt, Wim. Yes, he was all in one piece, which was the biggest surprise of all! Ginnie Hart: You're most kind, George! Thank you. Ginnie Hart: Oh yes, Oscar. Perfect for Halloween. Thanks. beautiful macro shot of the cricket. like the overall focus displayed here. Ginnie Hart: It's good to see you again, Liang Thank you kindly. Oh my ! What a fanatstic shot indeed with this thrilling posture ! Incredible and talented photograph Ginnie ! Bravo to you. Ginnie Hart: You sure know how to make my day, Flo. Merci.